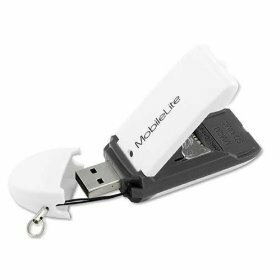 I went looking for a new USB2.0 memory card reader the other day, having lost my previous one - and came across the Kingston MobileLite 9-in-1 device. It’s really inexpensive, and has 3 seperate sockets for a series of different memory card formats. As you can see from the photo - the sockets are protected by a couple of plastic housings - allowing you to store the memory cards inside the device itself. When you connect it to your PC - it actually shows up as 3 different drives, so you could use it with 3 memory cards as a sort of triple-memory-stick in one unit. The SD sized slot on side A supports SD/SDHC, MMC, MMCmobile, RS MMC, and MMCplus card formats. The first slot on side B supports microSD and MMCmicro, and the second supports miniSD.